Hand-crafted Dutch style rectangle wood gazebo measures 10' by 14'. Assembled with stainless steel screws and glue coated galvanized fasteners. Engineered to withstand strong winds & heavy snow loads. Made from #1 Premium grade pressure treated lumber. Craftsmanship and materials are backed by a ten year limited warranty. Each wood gazebo is hand-crafted in the United States by expert Amish woodworkers and finished to order with your choice of stain, paint, roofing and other custom options. Model shown in photo measures 12' by 16' and features optional cupola, optional cedar roofing and optional screen package. Hand-crafted Colonial style rectangle wood gazebo measures 10' by 14'. Assembled with stainless steel screws and glue coated galvanized fasteners. Engineered to withstand strong winds & heavy snow loads. Made from #1 Premium grade pressure treated lumber. Craftsmanship and materials are backed by a ten year limited warranty. Each wood gazebo is hand-crafted in the United States by expert Amish woodworkers and finished to order with your choice of stain, paint, roofing and other custom options. Model shown in photo measures 12' by 14' and features an optional cupola. Hand-crafted Dutch style rectangle wood gazebo measures 10' by 16'. Assembled with stainless steel screws and glue coated galvanized fasteners. Engineered to withstand strong winds & heavy snow loads. Made from #1 Premium grade pressure treated lumber. Craftsmanship and materials are backed by a ten year limited warranty. Each wood gazebo is hand-crafted in the United States by expert Amish woodworkers and finished to order with your choice of stain, paint, roofing and other custom options. Hand-crafted Dutch style rectangle wood gazebo measures 12' by 14'. Assembled with stainless steel screws and glue coated galvanized fasteners. Engineered to withstand strong winds & heavy snow loads. Made from #1 Premium grade pressure treated lumber. Craftsmanship and materials are backed by a ten year limited warranty. Each wood gazebo is hand-crafted in the United States by expert Amish woodworkers and finished to order with your choice of stain, paint, roofing and other custom options. Hand-crafted Colonial style rectangle wood gazebo measures 10' by 16'. Assembled with stainless steel screws and glue coated galvanized fasteners. Engineered to withstand strong winds & heavy snow loads. Made from #1 Premium grade pressure treated lumber. Craftsmanship and materials are backed by a ten year limited warranty. Each wood gazebo is hand-crafted in the United States by expert Amish woodworkers and finished to order with your choice of stain, paint, roofing and other custom options. Hand-crafted Colonial style rectangle wood gazebo measures 12' by 14'. Assembled with stainless steel screws and glue coated galvanized fasteners. Engineered to withstand strong winds & heavy snow loads. Made from #1 Premium grade pressure treated lumber. Craftsmanship and materials are backed by a ten year limited warranty. Each wood gazebo is hand-crafted in the United States by expert Amish woodworkers and finished to order with your choice of stain, paint, roofing and other custom options. 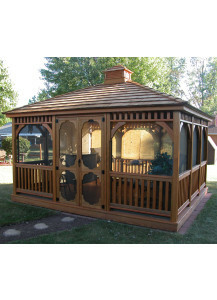 Hand-crafted Dutch style rectangle wood gazebo measures 12' by 16'. Assembled with stainless steel screws and glue coated galvanized fasteners. Engineered to withstand strong winds & heavy snow loads. Made from #1 Premium grade pressure treated lumber. Craftsmanship and materials are backed by a ten year limited warranty. Each wood gazebo is hand-crafted in the United States by expert Amish woodworkers and finished to order with your choice of stain, paint, roofing and other custom options. Hand-crafted Colonial style rectangle wood gazebo measures 12' by 16'. Assembled with stainless steel screws and glue coated galvanized fasteners. Engineered to withstand strong winds & heavy snow loads. Made from #1 Premium grade pressure treated lumber. Craftsmanship and materials are backed by a ten year limited warranty. 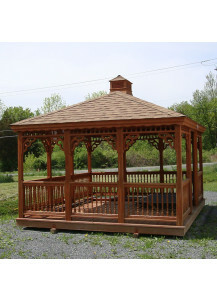 Each wood gazebo is hand-crafted in the United States by expert Amish woodworkers and finished to order with your choice of stain, paint, roofing and other custom options.